You know how you always need extra table surface when you are glazing? I found a perfect temporary table at the curb outside a neighbor's house. Of course, I didn't know that's what I wanted it for when I grabbed it, but I knew it must still have some usefulness. Because the summer studio is a small space, even a card table is too big to work around, and there's nowhere to store it when not in use; the ironing board folds up flat and narrow and can tuck under my work bench. Problem solved, and for free. I love recycling. For "self-storage," read "insurance." Ugh, no. Burn the boats! In the book Cold Mountain by Charles Frazier, the heroine Ada is in desperate circumstances before she meets the resourceful Ruby, who shows her how to turn what she has into a comfortable life. Ada's transformation from a helpless waif to a competent woman, while not exactly the central theme of the book, is very inspiring to me. My favorite chapter is entitled "Verbs, All of Them Tiring," in which Ruby walks around the farm with Ada, taking stock of what they have and what needs to be done. 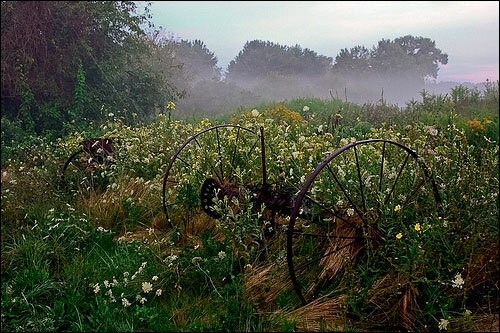 There's a long neglected apple orchard, a crop of tobacco abandoned in the spring, with which the women can barter for other goods; they have hayfields, which need cutting, and a root cellar which needs to be dug out deeper. All in all they have a great deal to work with: work being the operant word. This is inspiring to me because, as you read the previous chapter, Ada's situation seems quite hopeless. It is only seeing it from Ruby's perspective that both Ada and we, the readers, see what it could become. I feel I need to take stock, too. What assets do I have? What potentials? What needs to be done to develop the potentials? What am I able to do right now? 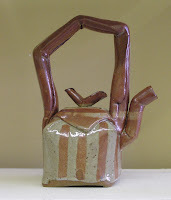 I have a kiln, a home-based studio, and all the necessary equipment to produce pottery. This is the baseline. 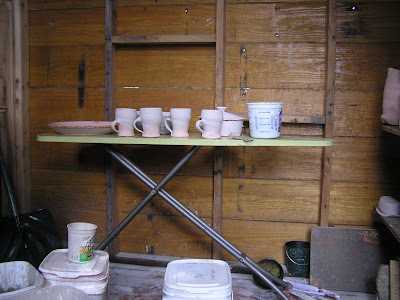 The kiln could be more useful if it were rebuilt, because it is too loose and inefficient to be used for glaze firings; right now I can draw a plan for the shelter (no point building a new kiln if it's going to sit out in the weather), and purchase the materials for that. I have several consignment outlets; those could (perhaps) do better if the work were refreshed more often. Right now I can schedule a firing for this week, and switch out the work at some of them. I am juried in the the Center for Maine Craft; instead of waiting for them to call me, I can contact them about a wholesale order. I have a good camera, and a graduated backdrop to shoot my work. I can take some new shots and apply to the Northern Clay Center's upcoming jurying. Tiring verbs, indeed! I need to stop there, as I am beginning to feel overwhelmed. Imagine if I'd been Ada, listening to Ruby's much lengthier to-do list! Of course Ada had the additional motivating factor that her alternative was starvation. I have to IPTOG which effectively insures my continued comfort, if not affluence (HA!) Which brings me to the next phrase which is caught in my head: Burn the boats? 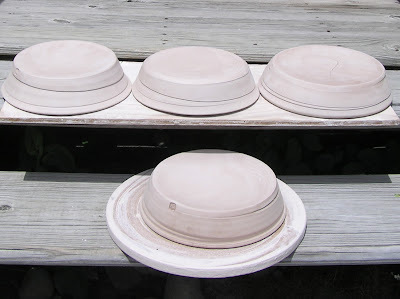 I was in such a hurry to get these dishes into this bisque that I did what I absolutely know better than to do, and I put them out in the sun to dry. They were fine, actually, in the mottled sun on my deck but they weren't drying fast enough for me, so I out them on my south-facing front steps, with the predictable result that one of them -- the one on the top right -- developed an s-crack. These are for an order. I wanted to get them into this bisque, because if I didn't, it would put off their delivery for another month -- and I was already a little slow getting started. A couple of weeks went by before I even threw the pieces. It's worth remembering that once I started, it only took fifteen minutes to throw four of these, and they don't need to be trimmed. These particular pieces (which didn't start out to be custom, but she kept getting gradually more and more specific) don't need any decoration, so the fifteen minutes, plus a minute or two with a rubber rib on the bottom, is all the wetwork time I have in them. Fortunately I only need two. The surviving three did make it into the bisque, and will be fired on Wednesday; and I can cross one more thing off my to-do list. 1) Drop off work in Conway, Casco, and Bethel. And that's not even including household stuff like "Mow Lawn" or "Change bedding." Those items would be numbers 2 & 3, which makes them slide off the list entirely. Still, can't complain. We'll make the deliveries today & visit friends in Bethel. It's a nice bright day for a drive. Finish enough inventory for my seasonal shops, which means two firings by the end of the month, or first of next month. Mix at least one test glaze for each firing. Remember, glaze tests are our friends! List or re-list four items a week on Etsy. I have adjusted my expectations for Etsy, after a period of intense promotion and then frustration. Now I think of it as just anothe consigm=nment outlet, one with a (much) better split, but with a similar yield: a few sales a month. Consignment sales are like the weather: sometimes it rains, sometimes it doesn't. You don't beat yourself up if you can't make it rain, but if it's not raining one place, it might be in another, so it's best to have multiple locations. These goals are very modest, but as I said earlier, I expect to be working ALOT more hours at the IPTOG, until they have re-staffed. I'd like for the kiln shelter to be on the list, but there just isn't going to be time for that. Unless I could persuade Doug to do it...? He likes to build things. Oh, honey....? I opened up the summer studio yesterday while the sun was out. What a mess! It's a bit too early to move the wheel out -- still chilly at night here in Maine, and evenings are when I do most of my studio work. 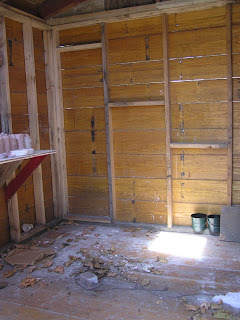 I would like to use it as a glazing shed, though, because glazing is so so messy indoors. Will try to get it clean enough to mess up later today. Happy Mom's Day to the moms out there, and, hey, everyone else, too, because, why not? 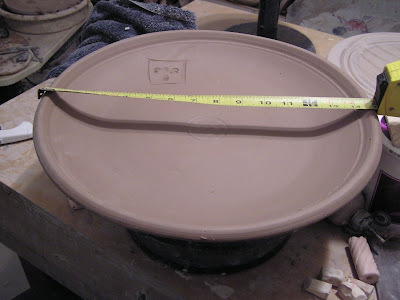 I wish I could say that I've been hard at work in the studio, cranking out pots, but sadly, no. 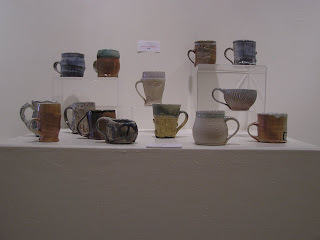 I did do a firing last week, most of which went to Summer Island Studio, a new store in Brunswick, Maine. The rest of the week was consumed by the IPTOG which has suddenly become more demanding with the departure of a key support employee. So I'll be working more hours for a couple of weeks, anyway. I also wasted an astonishing amount of time playing Mafia Wars on Facebook. Want to join my Mafia? You can find me on Facebook; my real name is Lori Watts, from Augusta, Maine. Mafia Wars made me think a bit, though, so perhaps it wasn't a complete waste of time. In the game, whenever I earned play money (by, you know, robbing convenience stores and beating up rival gangsters, stuff like that), I immediately invested the money, either by improving my character so as to more effectively rob convenience stores and such, or by purchasing income property or tools of the trade. 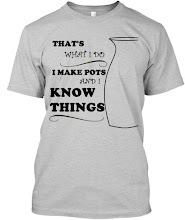 It occurs to me that I must make a point of doing something analogous with my income from pottery. Instead of letting money from sales be absorbed into the household income stream, I should use it to either improve my skills or increase my sales. I'd love to write more but the Don wants to see me about a hit. I'm delighted to report that the show went well! We had a good turnout -- and that was at 9 o'clock in the morning. I have my students and friends to thank, because many of them made a special effort to be there. 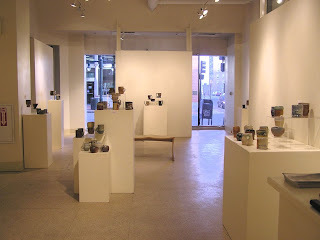 A full gallery draws more people, while an empty gallery discourages. I still have about forty-five mugs (guessing), which will now make their way to various other outlets. Context matters. While I was pricing, $20 or $30 seemed like a crazy price for a mug. It would be, at KRA. In the formal, gallery setting, it seemed more than reasonable. I could get used to that! 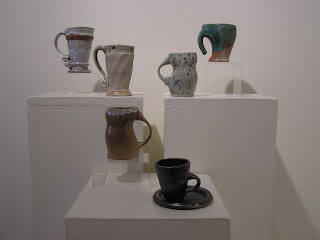 Context part 2: Several of the mugs were wonky: functional but functionally and aesthetically challenging. These I fully expected to still be in possession of at the end of this event. I was proud of myself for not being influenced by what would sell, and making pots true to the original spirit of the project. Surprise! The funky mugs are almost all gone. That would not have happened at a retail store, where people seem to prefer handmade things that almost look mass-produced. My theory is that folks are unconsciously choosing work that they are comfortable with; pieces that look like what they are accustomed to. It can be uncomfortable to have your aesthetic challenged with your morning coffee. It takes a certain kind of person to welcome that. Those people are in greater proportion, apparently, in a gallery than a store.